Tired of ducks flying high overhead and not paying attention to your decoys? The XS Floating Flasher has just the right amount of flash to create attraction towards your spread which simulates perfectly a mallard drake stretching his wings or landing. Photo printed wings on the top side for realism. Textured float to help blend in with the natural mud color of water. Along with others in the XS line it includes the newer and smaller 12V lithium ion battery reducing overall size and weight that sits recessed within the decoy body. Recommended water depth is water as shallow as 6 inches. Anti-flipping device included for high winds situations. Remote/receiver compatible (sold separately). External quick-charge port. Water-resistant switch. Runtime: 10hrs. Fast recharge time of 3 hours. An additional battery can be added (sold separately) that will double the battery life. Package contents: decoy, battery, charger and operating instructions. A percentage of your purchase will go to Ducks Unlimited to help with their efforts for wetland conservation. 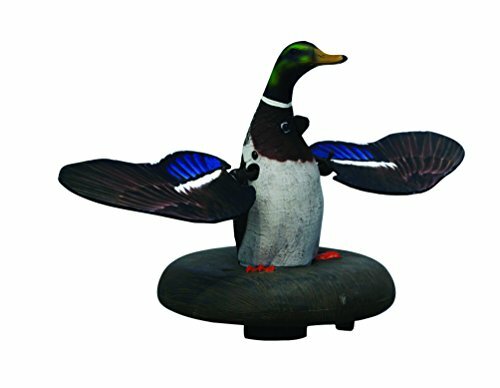 If you have any questions about this product by Higdon Decoys, contact us by completing and submitting the form below. If you are looking for a specif part number, please include it with your message.